What’s wrong with that ? 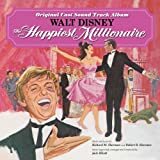 – Paroles de la chanson dans “Le plus heureux des milliardaires”. What’s wrong with that ?. Interprétée par Fred MacMurray et Lesley Ann Warren . I’ve been bit on my finger. It could’ve been my leg. It could’ve been my head. In a time of mortal peril. That his family will come. My family rushing to my side. No wife could have a life. So when a good-hearted husband. Has been bit, it’s only right. That his wife should bear the. I want my wife to share my life. Here in this house I’m raising. In their father’s time of need ? I give them private tutors. I believe in Uncle Sam. And as sure as old glory. I believe a man who has been bitten. Has the right to demand. That his family would give him. The flag above, the Bible, and love.